The phrase “right in my eyes” (14:3) is significant because that same phrase (more or less) is repeated in Judges revealing that everyone was doing what was right in their eyes and not what was right in GOD’S eyes. Even Samson, who is one of the supposed Israelite leaders (appointed from inside his mother’s womb), had been doing whatever he wanted, seemingly without thought for God’s law, which clearly prohibited foreign marriages. …it was from the LORD, for He was seeking an opportunity against the Philistines. Somehow God had allowed this to happen so that He would have more opportunities to strike the Philistines for the sake of His Covenant People. The same Covenant people who had strayed so far that they didn’t even bother crying out to their God when the oppressors came. Yet God pursued the faithless ones. Can you think of any other men of God whom the Lord determined would marry unsavory brides? Hosea! We’ll learn about his wife, Gomer, later on in our study. It is good to remember that the Scriptures were not being written as the events were happening. The historian/writer has the advantage of hindsight to see how God was present in the situations that unfolded for Israel. Isn’t that how it seems for us sometimes? It feels like we can often see God more clearly after the difficult season is over. We can attribute God’s work in our lives more easily once we’ve passed through the trials. We see His work as protection or see His love in the way He withheld something we thought we wanted/needed. He is ALWAYS at work in our lives even though we may not always know how. And when we don’t understand His hands, we can always trust His heart. This is one of those topics that is hard to address because it reveals how little we know about God’s sovereignty and our own will. I’m not going to get into free will and God’s sovereignty at this moment, because I don’t think anyone can fully understand how it all works. I am, however, absolutely certain that I need no help from God to commit sins. He is never responsible for my sin because He is perfectly holy. However, God is responsible for any good thing in me. He is the one who works in me, conforming me into the image of His Son. So was Samson an oblivious man of passions or a man in tune with God’s plans? Then in verses 5-6 we have this weird story about Samson tearing apart a lion and they seem rather awkwardly and inappropriately placed in the middle of a wedding proposal and feast! (Not exactly a bride’s dream) But this story is important for understanding Samson’s riddle later on. It also represents something very important for Israel! for the child shall be a Nazirite to God from the womb, and he shall begin to save Israel from the hand of the Philistines. I place emphasis on the word BEGIN for Samson did not finish Israel’s business with the Philistines. David is actually credited with ridding Israel of them (2 Sam 8:1). he turned aside to see the carcass of the lion, and behold, there was a swarm of bees in the body of the lion, and honey. Again we have this image of a lion, but now it is a dead, rotten carcass with bees and their honey inside of it. Samson eats the honey and gives some to his parents. You might have picked up on the fact that this would have broken his Nazirite vow, defiling himself by having contact with the dead. But something more is at play because nothing is mentioned about the broken vow. This narrative is what I call a “teaching sandwich” in the sense that something happens (Samson rips the lion apart), the scene goes on to a seemingly disconnected point in the story, then something else happens to connect the events all together (carcass). It’s just like what Jesus did in Mark when He cursed the fig tree, then drove out the money changers, only to return to a withered fig tree in order to teach about who His true disciples were (as opposed to the money changers). Mmmm take a huge bite and taste the honey! First of all, it would have been unheard of for bees to settle into the carcass of a dead lion. This in and of itself would have been as miraculous as the defeat of the lion. It appears as though the writer of Judges is revealing how God would, starting with Samson, destroy Israel’s enemies, giving Israel back their home where they could again be a community enjoying the fruits (HONEY) of the land. Next we have the wedding feast in verse 10. The word feast (mishteh) can mean drinking feast. (footnote in ESV) Most scholars believe that Samson couldn’t have avoided the drinking that would have taken place at this feast. All throughout these chapters, we have no sense that Samson is even aware of his Nazirite vow. That is, not until he tells Delilah his secret. So even though we’re jumping ahead a little bit, it helps us understand that Samson had the knowledge of the vow. However, this knowledge didn’t seem to stop him from breaking it twice now, seemingly showing no care or honor for God’s calling on his life. The supposed leader of the Israelites had rejected the knowledge of his high calling. So isn’t it ironic that he decides to try his hand at a riddle. The use of riddles at feasts was popular in the ancient world. You may recall the queen of Sheba asking Solomon “hard questions”, very likely riddles (1 Kings 10:1; 2 Chron 9:1). Solomon later became the famous author of proverbs and riddles. Ezekiel was instructed to speak a riddle to Israel in 17:2. To know dark sayings was considered a mark of wisdom (Prov. 1:6). So what does this say about Samson? He had some degree of intelligence about him that he was able to come up with this clever riddle which, by the way, his companions tried and failed to solve! It says in verse 14 that they tried to solve it for 3 days until they asked Samson’s wife to entice him to give her the answer. Their motivation for her? We’ll burn you and your father if you don’t find out. I almost feel sorry for Samson’s new wife. Verse 17 tells us she cries for the 7 days that the feast lasted, no doubt terrified at the thought of being burned alive with her father if she failed to discover his secret. So much for a fun wedding party! Poor poor Miss Philistine. The phrase in verse 17 “she pressed him hard” is the same wording in Judges 16:16 when Delilah “pressed him hard day after day”. The word carries a note of distress and oppression, enough to cause Samson to break down and give in to her “pressing”. Or did he? Did he know all along what was happening, allowing his new wife to badger him for those 7 days, and then gave her the answer at the very last moment, ready for another skilled retort to answer the Philistines? The men answer Samson in the form of a riddle, and you can almost taste the irony in their answer. “What is sweeter than honey? What is stronger than a lion?” Who was it that simply ripped a lion in half? Samson. So it appears as though Samson is stronger than the lion. He didn’t keep that part a secret for nothing! But the true answer may well have been LOVE or a woman’s allure. (NIVAC) Samson may have been referring to the irresistibility of love. J (by Philip Nel The Riddle of Samson in Biblica). Love is sweeter than honey, Love is stronger than a lion. Perhaps now you can see the irony in his riddle as he is overcome with “love” for these women of Philistia! Samson gives his retort, another riddle in the Hebrew (v. 18), as if he had already planned how to respond, knowing all along that his wife was going to betray him. And then they get to find out just how strong this man is! 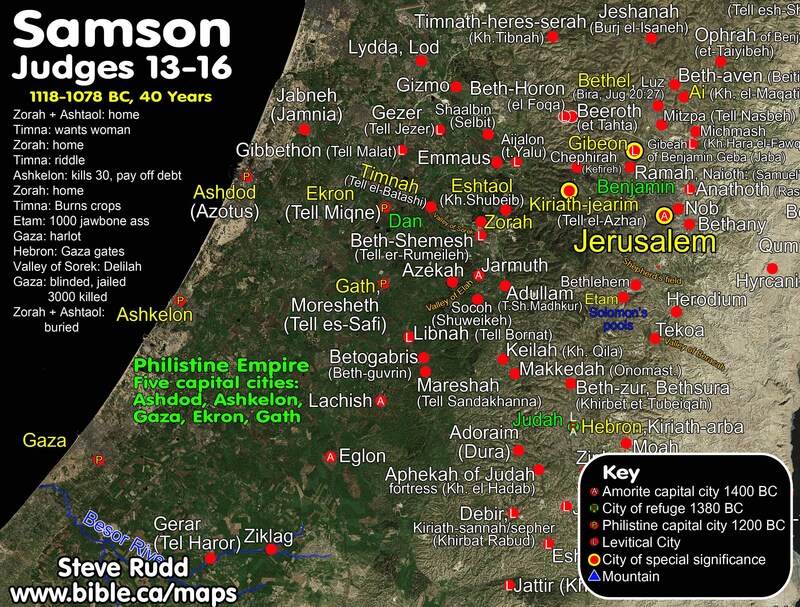 The Scripture says he went all the way to Ashkelon to strike down these 30 men. 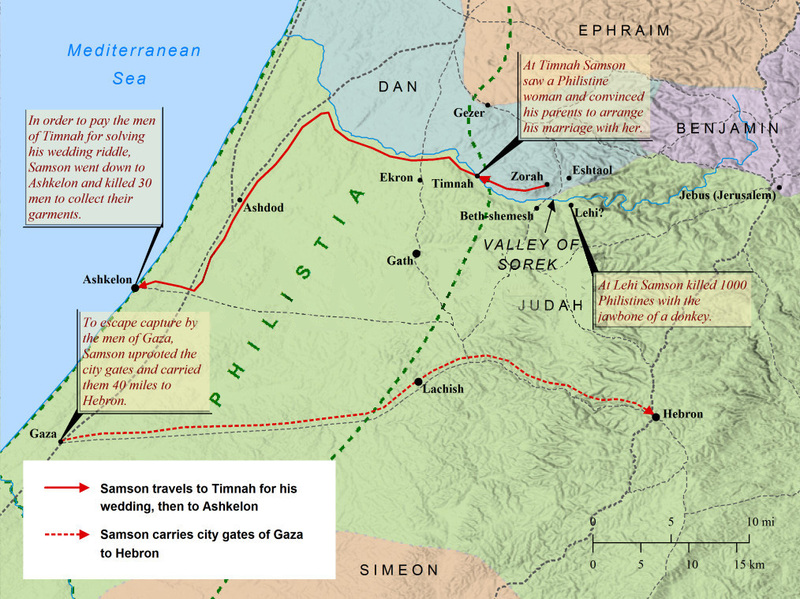 To give you an idea of the distance here is a map showing Timnah and Ashkelon: It was approximately 30 miles southwest of Timnah! Verse 19 is the third time the Spirit of the LORD is mentioned in Samson’s life. There are four times in this narrative in which the Spirit plays a part in his exploits. The first time, I already mentioned, was at the beginning of his “career” in 13:25, with the Spirit “stirring” Samson. 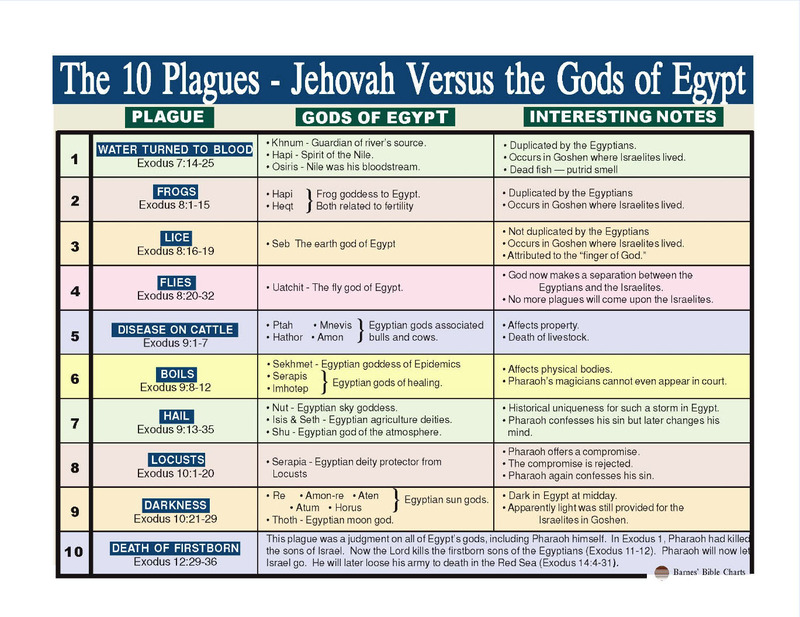 Then in 14:6 with the lion, here in 14:19 when he kills 30 men at Ashkelon (Philistine city), and also in 15:14-17 when he killed 1,000 Philistines with the jawbone of a donkey. In the last three verses, the text says the same phrase: “The Spirit of the LORD rushed upon him”. Here again we can assume that either Samson is aware that God is with him and this is one of those “opportunities against the Philistines” OR God uses this man’s hasty and violent actions to bring trouble on the Philistines. Although his actions are violent, he makes good on his bargain by giving his 30 companions the promised clothing! There is absolutely no mention of Samson being angry with his new wife about giving him up. But he is definitely angry. Marching out in “hot anger” to be exact. Then verse 20 wraps up the passage with a little tid-bit of information about his wife who now belongs to his companion, or best man. This is beginning to sound like an episode of Jerry Springer. Poor Miss Philistine gets shuffled around by her father, but perhaps she can look on the bright side, she didn’t die! And she still ended up with a husband! Taste the irony in our teaching sandwich. Then we get to chapter 15. Here again we find a very strange story, that grabs our attention and leaves us with an empty pit in our stomachs. It’s the classic case of revenge and tragedy, resulting in our sympathy even for the enemy. I want you to notice the description in verse 1 of the time of year. When you see descriptors like “wheat harvest” or other time references, they are almost always clues for understanding something else in the text. In this case we know that Samson dealt quite the blow to the Philistines when he burned up their ripe-for-harvest fields. 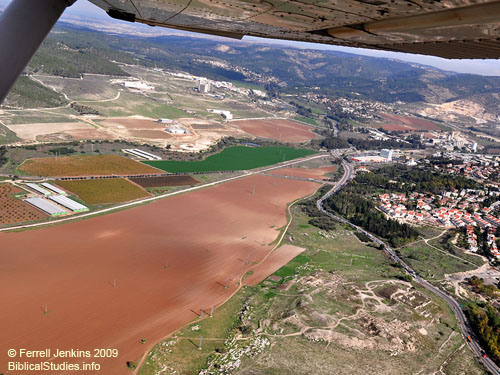 To give you an idea of the importance of the grain crops in this region, here is an aerial view of the Sorek Valley. The Sorek River winds its way from left to right. The Sorek Valley continues to the left where it runs into Timnah. You can see the Judean Mountains at the top of the picture. The Israelite towns of Zorah and Eshtaol would be in the foothills of the mountains there (among the trees). Beth-Shemesh, which is also part of Israel, is on the right hand side of the valley. You can see how fertile this area is and why both the Philistines and Israelites harvested their crops in the valley! To this present day the corn-fields in that part of the lowlands (known as the Shephelah) extend continuously for twenty or thirty miles. Samson arrives to collect his bride but finds out she’s been given away to his best man and is then offered her younger, supposedly more beautiful, sister. I pause now to ponder what Miss Philistine might have thought when her Israelite suiter came knocking for a second time. Did she have any affection for this man? Was she happy to see that he’d come back for her? Or did she only feel dread because she realized this man was reckless and bent on destroying her people? Was she happy to be with a man of her own people and bothered that Samson came back around? Was she afraid he might do something to put her life in jeopardy again? Samson obviously refuses the second daughter and in verses 4-5 sets about with the task of trapping 300 foxes, tying torches to their tails, and setting them loose in the valley where their fields of wheat, corn, and olive groves are ready for harvest. Samson’s revenge with the foxes does not involve the Spirit of God this time. It seems to be all Samson. Another opportunity against the Philistines! If fire breaks out and catches in thorns so that the stacked grain or the standing grain or the field is consumed, he who started the fire shall make full restitution. This time, God uses Samson’s actions to show that He is sovereign over Dagon, the god of grain. They would watch as the fire licked up the grain, vineyards, and olive groves – the 3 dietary and economic staples of ancient Palestine. (Word Commentary) And their god would be silent. You might even say He outfoxed them! All joking aside, do you see God’s relentless pursuit of His people? He is unwilling to share His glory with anyone! And He is jealous for His people. He pursues the enemy in wrath and judgment and yet will stop at nothing to pursue His beloved with His love and mercy, and yes even judgement. FEAR and LOVE mingled together. I almost hate to say it but she appears as a mere pawn in their game of war. She was an untimely interruption of the heart, having no happy interruptions from God, but only tragic interruptions involving the destruction of her and her people. She was a Heart Devoted for Destruction. We have one vengeful act stacked on top of another. The phrase “struck them hip and thigh” (v. 8) is meant to intensify the words “with a great blow”. One scholar writes that this could have been a “wrestling idiom [MEANING] total victory.” (Word Commentary p. 341; also in Tyndale “originating in the art of wrestling”). Then Samson retreats like an animal as he hides in the rock at Etam, in Judah’s territory. The map above shows where scholars believe Etam might be (although they admit they’re not even sure where it really is). It’s almost humorous the way in which Judah handles their fellow countryman, like Samson is their enemy. It seems that they want to avoid confrontation with the Philistines at all costs, and so they send a delegation the size of a small army (3,000 men) to Samson (Block p. 444 NAC). Then they actually talk him into giving himself up the Philistines. What follows is the famous story of Samson killing 1,000 Philistines with the jawbone of a donkey! Unfortunately, our woman of Philistia meets a tragic end much too early in her life. Her people had been marked by God, devoted for destruction, because of their sins against Him and their cruel treatment of His people.